How the hell are people getting so many of these 5 dot, 30speed primary stat, health mods?! I faced a guy a couple of weeks ago who had one on every character and I got demolished. Have spent thousands of energy since simming tier 3 health mod challenges and havnt gotten a single one. I've only gotten 2 arrow mods period in fact. Did he collect these before the nerf or is my luck just Bad? Precrafting 2.0: for a while t3 provided 100 percent drop rate of 5 star mods. People saved up 1000 cantina and just cleaned up. 3332 crystals... just push buy; if you don't see one... they're right behind the 15 crystal refresh button. I got 2 of them and 2 crit damage triangle mods during the precrafting phase. Haven't seen one since. It seems like there was slightly more variety during precraft 2.0. Now all I seem to get are square and diamond shaped mods. If they cost over 3000 crystals, it might be worth more than a lottery win. I got one after the drop rate changed. It's super awesome. Still looking for more though. Got one the other day for 2.5 million credits. Great buy, tbh. Saving credits till I see a couple more. I've got one lol. On two accounts too. The drop rates are **** so I gave up farming mods. ....2.5mil? I would never spend that much. I need every bit of my credits to level my mods. I got tons of 5* mods with B+ quality that need leveling.... I guess when you get to my situation... im hunting for the 4 secondary stats to fit my needs while you r searching for your primrary. Got one the other day, now Lum has 162 speed. With omega'ed cooldowns on Heal and Push, GW just became a lot easier. I got several but they really are not always the best mod depending on character. For example RG it's best to use Critical Avoidance. I've been getting mods since the beginning and I've never seen one. Indeed. Though I'd probably go with Accuracy for RG, since stunned heroes can't dodge, and dodge teams still seem to be a big thing (but you have to hit them first to stun). I have Crit Avoidance on Han. Just got wrecked by a speed arrow on Anakin, Rey, 5s, rg, sun fac. Ceeeeeelebrate good time, come on! I got around 75 mods before the drop rate nerfed to a terrible rate. Never got one. 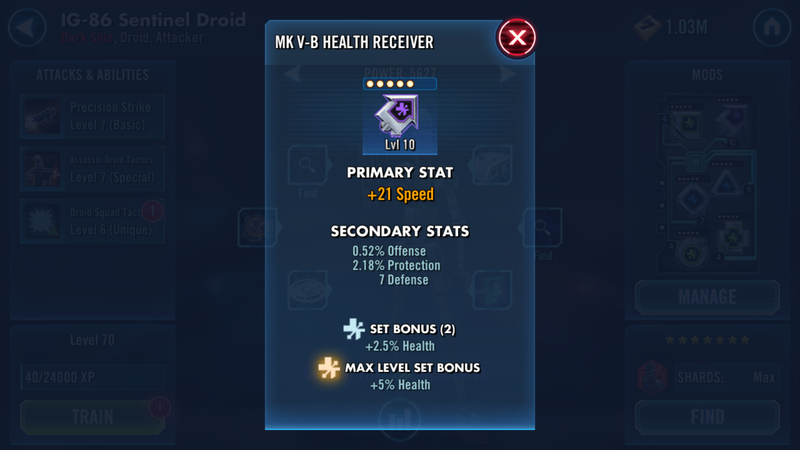 Never knew this was a thing until 2 days ago in GW node 11. That guy had 3 of them.